Meg tagged me a very long time ago and I am finally doing it! 01. I am a night owl. I do not like mornings at all and it takes me a while to wake up and be nice in the mornings. I usually get up around 9 and any earlier than that is so early. 02. I do not like chocolate. I prefer fruit desserts or my favorite bread pudding. And for candy anything sour. 03. I hate wearing jeans. I would wear a skirt over anything- except my pajamas. I have a couple of pairs from Anthropologie that I wouldn't minding ironing and wearing out- but they would still look like pjs! 04. I take bubble baths almost nightly. In fact thinking about it makes me want to stop this blog and go take one. 05. My favorite color is black- not depressingly so. I just think everything looks better in black, just a little classier. 06. I (and Nate) like to sleep with our kids. They are like live little teddy bears that just snuggle up to us at night. I have read and enjoyed many of his books. The number of temples built has increased. 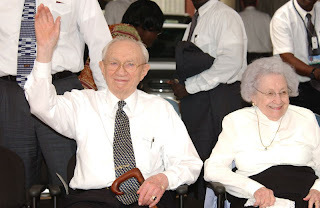 Many of us read the Book of Mormon as part of President Hinckley's challenge. So the cabin was a fun weekend, but once Monday hit I was sick! I rarely get sick so I thought this would blow over in a day or so. I had a headache all Monday which I thought was an altitude problem. Monday night it turned into a stomach ache and migraine and Advil was not kicking in. 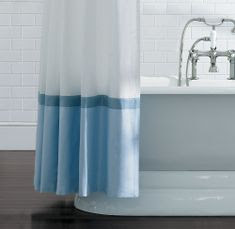 I took a bath and felt like I was going to pass out. I had a prescription of Zpac called in and expected to wake up Tuesday a lot better. But was worse. I went into my doctor and got an IV and went back to bed with the diagnoses of influenza and a sinus inflection. Everything hurt and nothing I did would ease the pain- headaches, double ear ache, super sore throat, a cough that made it really hard to breathe, stomach aches, back and chest pain, I was freezing but under blankets I was sweating from the fevers . . . Wednesday no better. Thursday another IV and by Friday I wanted to die. My boys woke up sick and I was certain if they got what I had they would be in the hospital because that is where I wanted to be. I was having one of those days where I was thinking "If this ever ends I will..." which is funny to think about now because it is obvious that it would end just a matter of time. Friday my doctor gave me a shot of steroids to help recovery. I hadn't eaten since Monday so nursing my baby was hard. And after the shot I had to stop nursing for 2 days because he could not have the steroids- This now ruined his life even more while he was sick. I had a milk supply pumped but he did not want a bottle from me when I had what he really wanted. I now see the end of the tunnel. 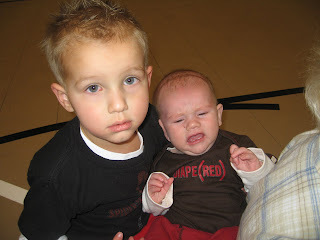 My boys were only sick for 1 or 2 days and I am reaching the end of my aliments. I am back to being "mom" but we are still doing family nap time in the middle of the day. I think my energy supply will take a little while to get back. Thank goodness for Nate- he took time off work to run the house- and my mom also took my boys a lot. I do not know how else the past week would have been possible. Next year the flu shot is a strong possibility. We spent Martin Luther King Weekend at a Cabin in Duck Creek with some friends. The boys had a blast. Nate put his snowboard to good use once again this season. Krew & Matix had fun in the snow just walking around and throwing it at each other. 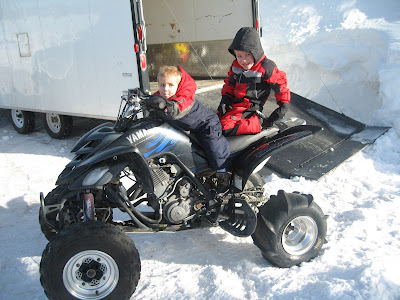 Matix loved riding the 4 wheeler and snow mobiles, but Krew is not such a thrill seeker and whined the whole time he was on one. Matix climbed up onto a snow bank. 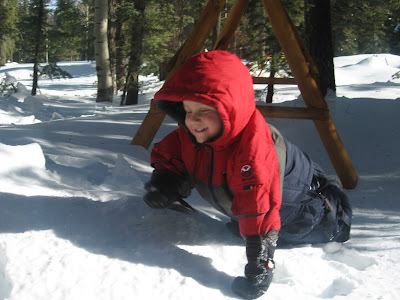 Once he started walking on it he kept sinking, so he gave up and started crawling to get off the snow. It was amusing! But smart kid to crawl. That put an end to the sinking problem. I am glad he was smart enough because it would have been humorous if I crawled out to get him in my pajamas. I definitely would have sunk! 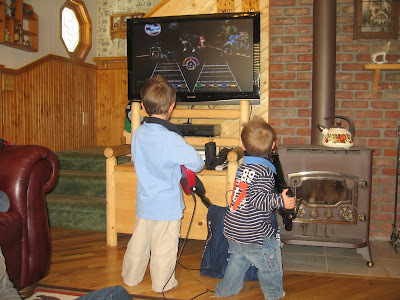 Krew & Matix learned how to play Guitar Hero. This game is addicting. I spent one of the days learning how the game worked and then challenged Nate to battle after he got home from the slopes. Thinking I could wow him with my coordination. He won one & I won two. However, he will still claim I cheated to make his case. We have a friend who works for the company that makes the jerseys for sports teams- like UNLV. For Christmas he had jerseys made for our boys. Krew & Matix love them. Their numbers on the back represent their ages for the season. 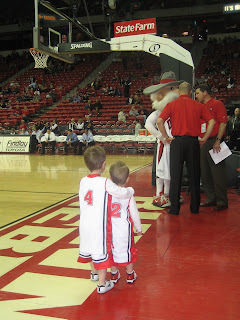 They wore their jerserys for the first time to the game against BYU. And surprisingly UNLV is playing decent so far this season. I finally found a Halloween picture off my mom's camera. 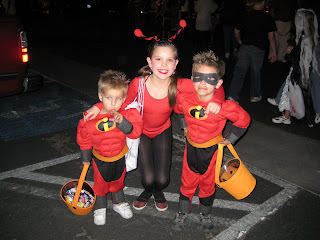 I realized after the holiday that I had not taken any photos of my kids this Halloween. I might put them in their costumes and take one. They still play in their costumes. 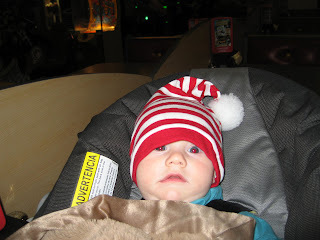 In fact, Matix was in his this morning when I took Krew to school. Walking in everyone was smiling at him- He truly was a super hero today. Bikram Yoga is a style of yoga created by Bikram Choudhury. He claims his style is the only true hatha yoga practiced in the West. It's a series of 26 yoga postures called asanas and two breathing exercises performed in a 100F room during a 90 minute period. The heat loosens the muscles, helps to prevent injury and makes you sweat excessively, leeching out toxins. And for some reason I find this to be enjoyable! I usually do dread going, but I go because when I am done I feel great. For Christmas Nate gave me a year membership to the studio I have been going to. I am excited to go more often. Little Brothers are so great to have around! 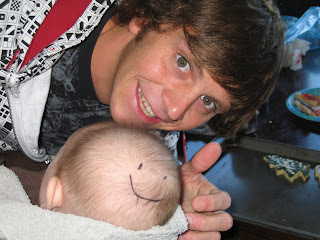 Thank you Brandon for adding eyes to Nixon's head with Sharpie. 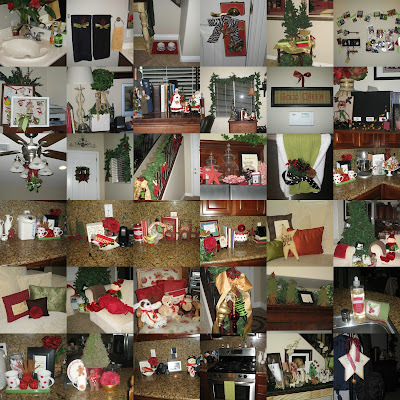 I finally put Christmas away! It took about three weeks to slowly get it up and 1 1/2 days to get down. My house now feels empty. Thanksgiving Dinner was with Nate's family this year. His brother Greg & wife Kristy were hosting at their house- Kristy's parents joined us too. After dinner, somehow the topic turned to a dare. The pool looked cold and money was getting placed (we were up to an easy $60) on Gary (Kristy's dad & triathlete) to see if he would jump in the pool. 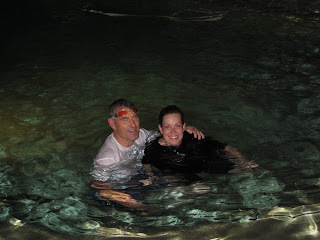 Then I joined into the conversation saying I would jump in- so now the bet is who can stay in the longest. I was not expecting to stay in long but at least give Gary a run for his money. He was not going to make money that easily. I know we checked the water temp, but I forgot what it was at. We both jumped in one after another by going down the slide. Going down the slide I was wondering what I was thinking. Surprisingly though after the initial shock of the water- it wasn't bad! We ended up making a truce and splitting the pot of $70. I spent my money on Starbucks. 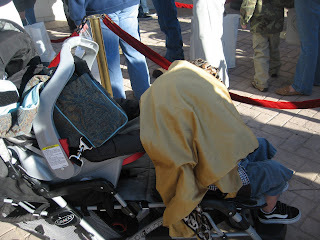 Matix was trying to get warm- Nixon was strapped to me. A little bit before Christmas I took Matix & Nixon to stand in the cold weather (rare for us but very true). Why?! Because their crazy mom had a ticket to have Rachael Ray sign her new cookbook that had just been released. There was Chicken Noodle Soup & Hot Chocolate making the rounds though! The store had employees serving that to everyone waiting. 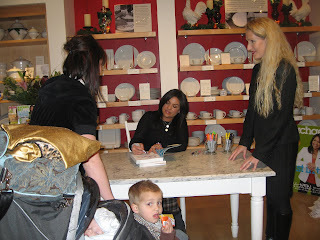 The book signing was at Williams Sonoma & they were only letting a few people in at a time to see her. It was exciting & fun to see her. She looks like she does on T.V.- not better, not worse. Sometimes when people see celebrities in person they say they look shorter, fatter, prettier, etc. Rachael was just a pretty and she was sitting so I'm not sure about the height thing. She had had a long day and her wrist was hurting from signing so she wasn't to social. If fact the store had been threatening to cancel the book signing because of her wrists. 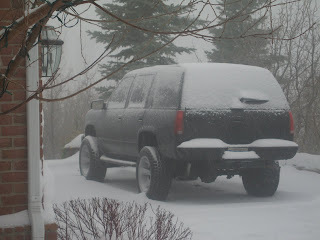 We drove up to Bountiful & Park City after Christmas to play in the snow. I gave Nate a new snowboard and boots for Christmas so he wanted to try them out. Our boys had so much fun. It wasn't until we were driving home that I realized I had forgotten to take pictures while we were playing with snow!